Announcing the official launch of the MaxHash Ethereum Mining Pool! 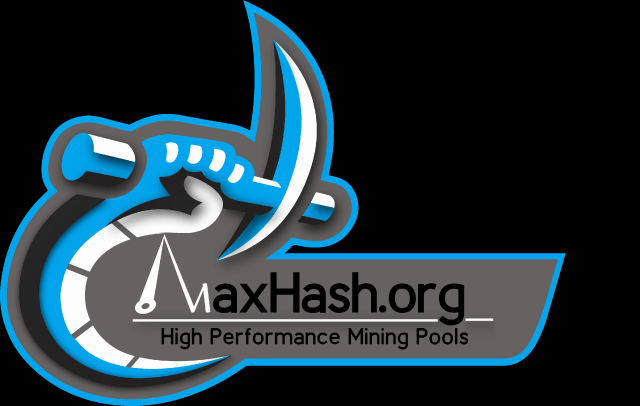 Team MaxHash today has unveiled it's latest mining pool launch on the Ethereum network. Pool developers have loaded 0.1ETH into the Jackpot system to get it kickstarted! Welcome to MaxHash. The premium Ethereum mining experience. Operated by a team of blockchain and server administration experts and run on professional dedicated servers worldwide with 24/7 monitoring. We provide an enterprise grade service backed by responsive native English speaking support and a friendly community. Crypto Currency mining is no longer just a hobby for IT professionals, it's now a booming industry for people from all walks of life. So why settle for amateur mining pools run from somebody's bedroom? Mine with the pro's at MaxHash! Tired of poorly operated pools with a lot of downtime? No help or support when you need it? Paying high fee's for an inadequate service? Give MaxHash a try! Our mission is to achieve the best possible payouts, enhance the mining experience, and do so in an efficient and transparent manner. Maxhash pools are highly optimized and hosted on dedicated high performance servers currently in 2 locations (US & EU) that are fully DDOS protected. VARFEE system that only takes a fee when pool is profitable for miners. Unlike pools who take a constant fee from miners even when the pool is performing badly! Promotions to put the fun back in mining and make it more interesting for our miners. Check out our Block Finders Bounty and Jackpot bonus programmes. Expert support available directly through our Discord server and email. Become a member of our friendly and helpful community on Discord. Where you can find miners sharing tips & tricks. We take security seriously. The team has spent significant development and testing time on making our pools as secure as possible with numerous pre-cautions in place. You're in safe hands with MaxHash. World's first Jackpot Reward system for just for our miners! Its simple and unique. We are making mining more interesting for you! Exclusive to MaxHash and built in-house by pool devs. Loyal miners on the pool will have a chance every week to collect the Jackpot. This Jackpot consists of ALL proceeds collected from the pool VARFEE over a 7 day period. This lucky miner is then displayed on the shortlist of finalists and given a ticket number. Every Sunday at 23:00 (UTC) the pool will check for the block height number of the last matured block found by the pool before this time. The last number of this block will be the winning ticket! A loyal miner with this winning ticket number collects the entire jackpot! Numbers 1-7 are eligible to win the Jackpot. If the last number of the block is 8,9,0 then the jackpot will simply roll over to the next week and finalists will be reset. This system is exclusive to MaxHash mining pools as it has been built in-house by the pool devs. If you have questions or queries regarding the pool, getting connected or about our Jackpot system then feel free to get in touch. We are available through PM here, email (see website) and in our DISCORD server. Cool jackpot system, just got back into mining will check out the pool. Just got a block so miners interested in testing our pool now is the best of times to join! Also the jackpot is going to be really great this week ! It's not too late to win tomorrow's rather tasty jackpot (0.63 ETH)! until Sunday 00:00 CET. Also you need at least a hash rate of 20 mh/s. Hello development team of Maxhash ! Any body join this pool? have any feedback? Stats on the site look good. 62 GHS. Jackpot idea is kind of cool too. I haven't switched yet but i'm thinking about it. Also looking into setting up my own pool. If you join let us know how it goes. After my test is done with the current pool, I will jump in and see how this pool does. 1 eth now in jackpot wallet..
To benefit latency for our Asian/Oceanian miners we have now opened a bare metal server located in Singapore. with the uncle rate and also average uncle reward of a pool. Earlier today I made the following estimate to get some idea. So MaxHash profits 3.25% more eth than nanopool in this example. pool fee of 3% and still be ahead of nanopool. We have been finding blocks faster than expected lately but will the good run continue? Answer appears to be a yes! Check out the jackpot this week. Probably over 2 Eth on Sunday.. It's not too late to have a chance winning it. The draw is on Sunday. The pool has been beta tested for a period and has now passed that stage so we expect good stabiltity. Not too late to win tomorrow's jackpot. A lucky winner can get 3.5 ETH or even more! We have just officially launched a new Ethereum SOLO pool! Expect the same highly optimized mining engine, great uncle rates, and helpful support as our regular pools. One miner has already got very lucky and managed to find a block in less than 24 hours with just 3gh/s and earnt themselves a massive 3.03Eth! Welcome to check it out. There are rough times ahead for Ethereum with 33% of its block reward gone in just a few weeks. Where will miners go? Perhaps Ethereum Classic. For the miners who want a stable earning during the rough ride, MaxHash has decided to add a Pay Per Share (PPS) pool for Ethereum Classic, i.e., not luck based. A Callisto pool opened yesterday at MaxHash. Promotion - we have increased the block reward from 420 -> 450 CLO (i.e. 7%) making it the most profitable CLO pool in the world at the moment. This promotion will last at least 300 blocks ahead giving miners the chance to test the MaxHash ecosystem. A lucky miner will also win the Jackpot once a week.